This is a sponsored post written by me on behalf of Land O' Lakes, Inc. All opinions are my own. Summer...lounging by the pool, fresh produce everywhere you turn, glowing skin, cook-outs and bonfires...longer days to connect with family and friends. Sunshine and beautiful days are glorious things. But there's a dark side too all of that sunshine too, and it manifests itself in butter dishes on kitchen counters across the country in the form of a pool of melted butter. So, my sticks of butter stay in the refrigerator. It may be summer, but I still like to have spreadable butter on hand for my morning toast or pancakes. And we all know that attempting to spread butter pulled straight from the fridge onto a soft piece of bread isn't pretty. That's when having a tub of Land O Lakes® Butter with Canola Oil in the fridge comes in handy. You still get the taste of fresh salted butter that you love, but it's still spreadable, even when cold. It's a summer lifesaver. That oppressive summer heat that's hot enough to melt butter sitting on my kitchen counter also makes turning on the oven a little daunting. That means we eat a lot more cold sandwiches and salads this time of year and that my slow cooker gets a lot of use. But it also means that we eat a lot of heartier, from-the-oven meals first thing in the morning since turning on the oven that early doesn't make the kitchen unbearable for the rest of the day. Baked French toast is something that I've been experimenting with a lot lately. I love being able to prepare it at night before I go to bed, then pull it out of the fridge when I wake up and slide it right into the oven. Not only is it a great way of keeping excess heat out of the kitchen during the summer, it's perfect all year long for whipping up during the holidays, when you have house guests, or simply for ease on those lazy weekend mornings. 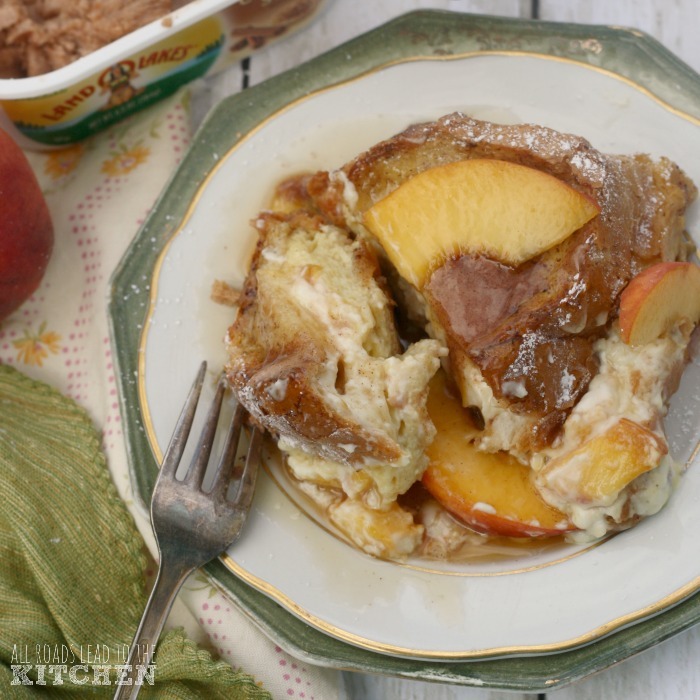 Since it is summertime right now, I wanted to make some French toast utilizing some of the sweet, juicy peaches that my family just can't get enough of. 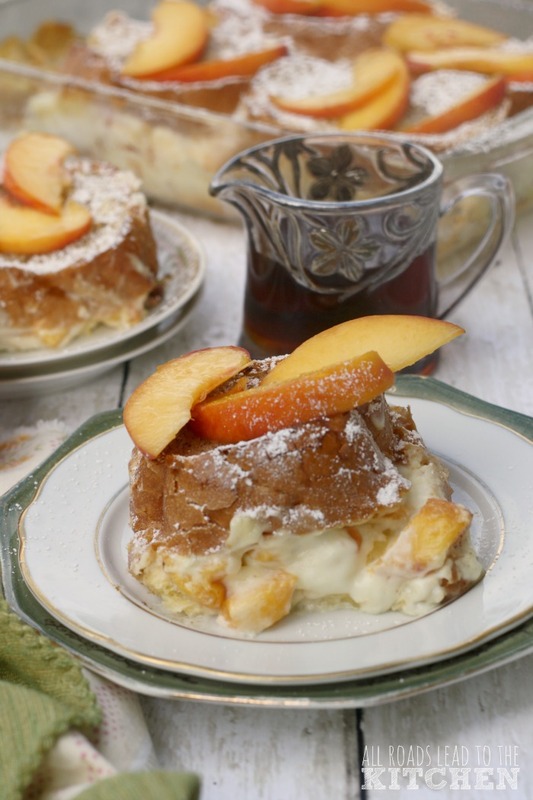 Pockets are cut into thick slices of French bread, then stuffed with a lightly sweetened mixture of cream cheese and peach chunks, which then sit in a cinnamon-infused custard overnight. In the morning, all you have to do is take the pan and your tub of Land O Lakes® Butter with Canola Oil (for dotting the soaked bread with) from the fridge while you preheat the oven. Just think about it...your belly is full, your oven is off and your kitchen is cool before the sun even begins streaming through your windows. Plus, you're left with plenty of time for enjoying those long summer days. 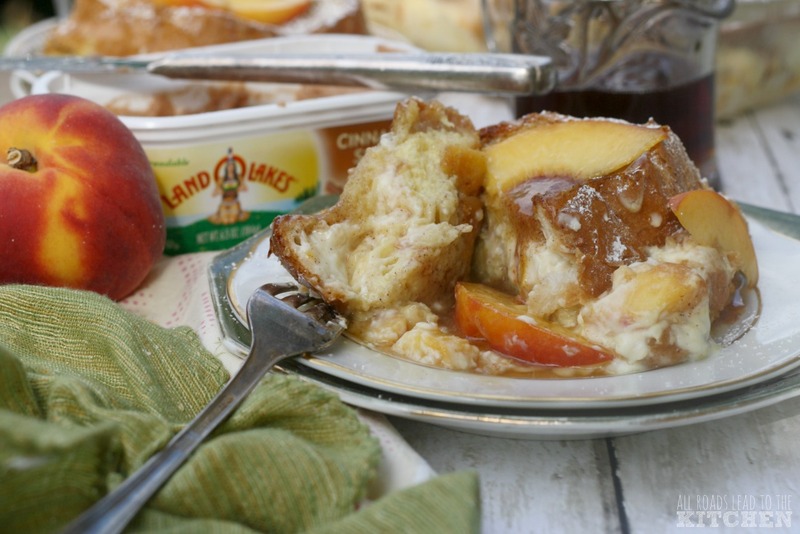 Juicy peach chunks and cream cheese make each bite of this stuffed French toast in a cinnamon-infused custard scream with the flavor of summer! Cut the ends off of the loaf of bread (eat them or use them for bread crumbs). Cut the loaf into 6 equal portions, measuring about 2-inches each. Carefully use a serrated knife to cut a pocket in the center of each piece, taking care not to cut all the way through. Beat the cream cheese and powdered sugar together until smooth and creamy. Pit and chop the peaches, then gently fold them into the cream cheese. Stuff 1/6 of the peaches 'n cream mixture into each bread pocket. 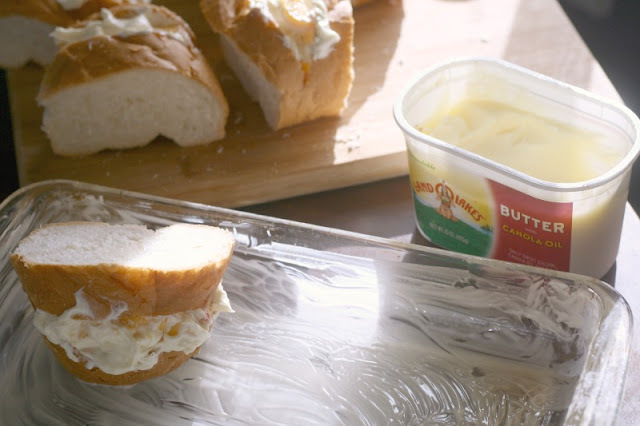 Rub 1 tablespoon of the Land O Lakes® Butter with Canola Oil on the bottom of a 7" x 11" baking dish. 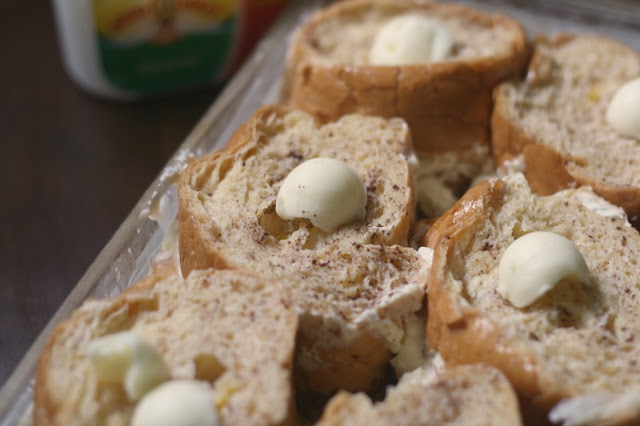 Beat the remaining ingredients together to form a custard, then pour over the top and around the bread. Use your hands to gently press the bread down, so that it soaks up as much of the mixture as possible, pressing down gently on each piece. Cover the dish with foil or plastic wrap and refrigerate overnight. Preheat the oven to 350° F. Remove dish from the fridge and Set a 1 teaspoon dot of the remaining butter on top of each piece of bread. Slide dish into hot oven until the edges are golden and the french toast is hot all the way through, 30 minutes. 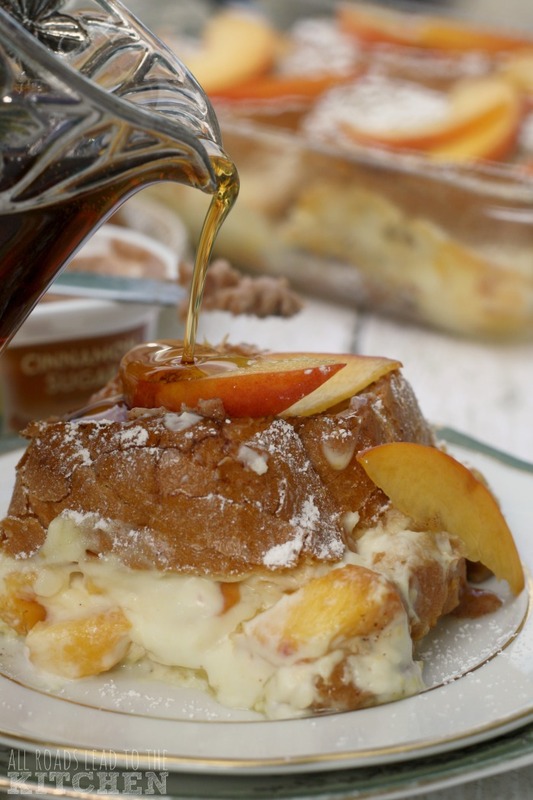 Slice the remaining peach and serve each piece of stuffed french toast, spread with a little Land O Lakes® Cinnamon Sugar Butter Spread, dusted with powdered sugar, scattered with peach slices, and drizzled with maple syrup (or any combination of the four). 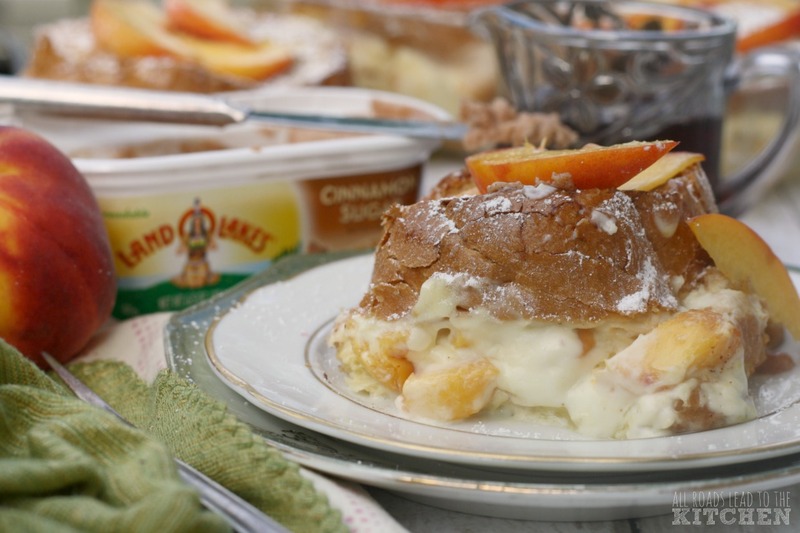 I am happy to be working with Land O’Lakes, Inc. as an Ambassador this year. I will be sharing recipes developed using their products through the end of 2016. 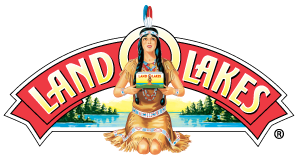 Land O Lakes and the Indian Maiden brandmark are registered trademarks of Land O’Lakes, Inc.